I know it's tempting, but ladies, please, don't mess with Butterbean's tail. Many have tried, and all have regretted it. I know she's just taunting you by flicking it about. Don't be mislead. She's not trying to entice you, this is a warning signal. Move it along, girls. Wait! You can't tease us this way. This post clearly demands video. 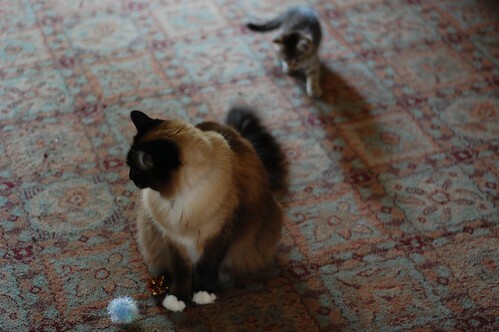 We need to see Bean tail in action, and kitten-learning in action. Don't mess with Charlene's sparkle ball either! Well, they have to learn these things somehow! As Anonymous said, "Kids gotta learn somehow!" I'm sure it's a gentle swat. 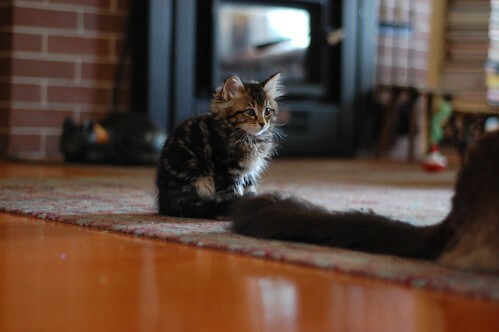 Let the record show, however, that it is a positively magnificent tail. We guess the kids have to learn the hard way! Butterbean has such a beautiful tail and she wants it to stay that way! 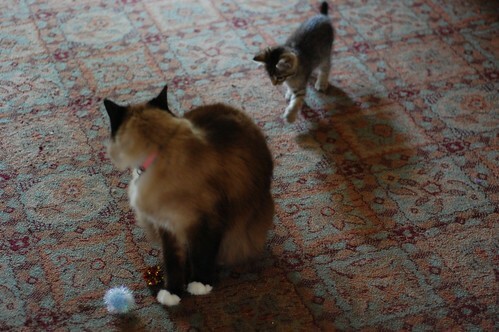 Your foster mum speaks the truth, kittens. I, too, have messed with Butterbean's tail. And although I lived to tell my story, I shan't do it again. At least that's what Bean wants me to believe. It's just so darn floofy! If I were an itty bitty, I doubt that I'd be able to resist the temptation, even if I did know better. That first picture tells the story of an incredible battle of impulse and restraint. DK - go ahead and swat it, its so FUN! AK - "be nice to the bean, be nice to the bean"
DK - go on, you KNOW you want to!